The Miner family is happy and healthy here in Georgia. Our big news for the year is that we've started building a new house in Mount Vintage Plantation, a golf community located on the South Carolina side of the Savannah river, but still part of the region surrounding Augusta known as the Central Savannah River Area (CSRA). Lisa's main occupation for the last year has been designing the new house. She produced the plans herself on her iMac and is maintaining a "Construction Central" section on her website to document the building process. As we go to press, the framing is mostly done and the gunite is in for the pool. We expect to move in sometime next spring. Our lot at Mount Vintage looks over the green of the 19th hole, which traditionally has been Steve's best. The "new nine" officially opened on March 14 to go along with the original 18 holes of the golf course. Besides working on the house, Lisa has also been active with ladies' clubs and gardening groups. She runs the web site for the Augusta Area Newcomers Club, and once again organized their annual English Garden Tea with her friend, Ruth. She also volunteered to help with the local Alzheimer's Memory Walk as a way to remember her mother. The Suburban Woman's Club of Augusta recently invited Lisa to join and she was also happy to accept membership in the Cherokee Rose Garden Club, which complements her volunteer work with the local Master Gardeners. She and Ruth went on a bus trip to Callaway Gardens together and she has dragged Steve to numerous nurseries in her quest to find interesting and unusual plants for the Mount Vintage garden. The dogs are doing well. Heidi (the Belgian Malinois) enjoys her short walks around the neighborhood. Cleo (the Great Dane) is full grown at about 115 pounds and needs long walks every day. She has a new best friend next door. Jenny (a boxer mix) moved in when her family bought the house earlier this year. Cleo was a bit shy at first but now they have a great time running and jumping on each other. Heidi can't take the rough housing so she stays home while the young kids play. 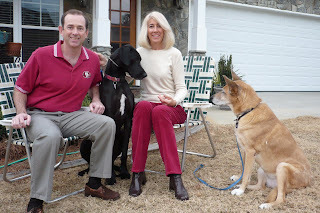 We made several trips to North Carolina to take care of the old house (still for sale) and vacation at the beach. Steve visited California to see his family just for a weekend back in January. Our only real vacation (that means one without the dogs) was a trip to Athens, GA, home of the Georgia University Bulldogs. Downtown reminded us a bit of Palo Alto. After a lengthy walk around the campus, we finally discovered the trial gardens and were excited to meet Professor Allan Armitage (a famous horticulturist) there. He graciously gave us a tour of the gardens and greenhouse and gave Lisa a test plant from the greenhouse. Steve's company has gone through a few changes with some friends leaving and new management coming on board, but his work is pretty much the same. He shipped a release of his communications equipment simulation software to good reviews from the customer. 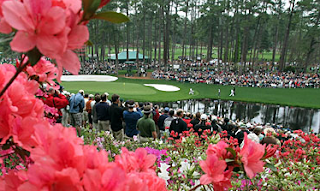 Steve was very fortunate to attend the Monday practice round at the Masters golf tournament this past April. In September, he got an iPod touch and loves it. He plans to write some software for the iPhone and Touch. Steve started playing volleyball again in a league in Augusta. He's the oldest guy in the gym (many of the players are half his age) but they've been very nice to him. One night, he wore a colorful tank top (a gift from Lisa because it was too big for her) and the guys on his team thought it was so cool that they named the team after it: "Jazzercise!". Nothing like having fun with the old man. No miracle wins this year for Stanford football. They had their chances to get a bowl game (especially against Notre Dame and UCLA), but they couldn't quite make it. Harbaugh has done a pretty good job, and they're expecting an excellent recruiting class next year, including a kid from Bellarmine (Central Coast Section champions). Plus, it will be Steve's 25th reunion so we're hoping for a good year. We visited our new house today, just in time to see the 1st floor walls going up. I watched the guys build my pool today - noisy, dirty and lots of fun. Here are some highlights. I got to lay a brick today, while they were pouring the pool. We visited the garden of Mary Alice Woodrum - a mix of tropicals, conifers and so much more. We spend the 4th at Mount Vintage - it is becoming a tradition. Then the following week we went to North Carolina for a few days and visited Brookgreen Gardens again. My young friend from work got married this past weekend. 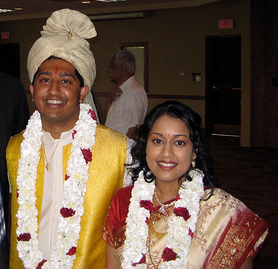 Kishan and Anita grew up in the Augusta area. 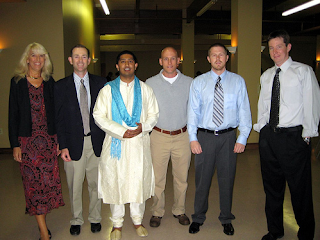 Both families are Indian so the wedding and reception were interesting cultural experiences for us. For those of you (including my wife) who think Catholic weddings are long, you should try a traditional Hindu wedding. I couldn't follow everything, as my Sanskrit is a bit rusty, but I'd have to say my favorite part of the four hour ceremony was the rite of the Kashi Yatra in which the groom leaves the building (as if on a pilgrimage to become an aesthete) and the prospective father-in-law retrieves him and convinces him to become a family man instead. It's a choice we all have to make at one point in our lives. Congratulations to Kishan and Anita. 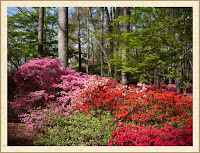 I organized a trip to the gardens of Susan Wood in Aiken. She has several acres of woodland which are being converted to gardens. We met with her landscape designer and toured the gardens. We held our annual English Garden Tea on April 22nd. It was at Gail's house. A "spiffing" good time was had by all. National Review has a memorial page for William F. Buckley Jr., the founder of the magazine and leader of the Conservative movement. 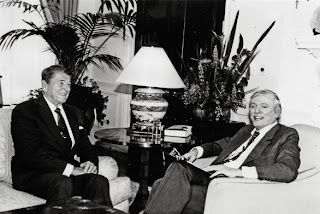 WFB died at his writing desk in his home on Wednesday, February 27. He was one of my personal heroes: a great and good man. Rest in peace.